^Samsung is not cheaper and being better is highly debatable too. Tesla is not in very good shape as it is right now. I can't imagine them being any better if VW and Toyota decided to sell similar product at 50% of the price. Assuming their models offers similar features and performance as Model 3. Yes they are $200 apart... but when both cost over $1200, i seriously doubt it makes any real difference to their buyers. So that is not a valid comparison. VW and Toyota are sooooo much bigger than Tesla, i would compare the situation to be Mama Papa's shops vs. big corporation. While there are many who prefer the smaller shops, the Big corporations have their ways to make the small shops miserable and suffer a painful death, IF they chose to. It almost has nothing to do with the product Tesla will be offering anymore. Tesla was ahead of everyone and now all the big players decided to heavily invest in its market, does Tesla have the funds and resources to continue to stay ahead of everyone? Cuz that was their selling point. It made a difference to me. I dunno about you, but I rarely go burn $200 just because. if you like apple, would you buy Samsung because it is 200 cheaper? or if you like Samsung, obviously you are not going to spend 200 more for Apple. Maybe they do exist, but i have yet met a Samsung/iphone user who makes the decision between Iphone and Samsung based on cost. most of them will buy the cheaper version of the same phone instead of jumping to the other side. So how about them veedubs? VW would likely dominate the European electric market first, but if they bring a $23,000 EV to the US, everyone might be toast. But they won't. Someone mentioned that it costs Tesla about $38K to make the $35K version of the Model 3 (if that ever shows up). VW might be able to get that cost down a bit slightly but nowhere near $23K. They are not going to sell huge volumes of cars at a loss in hopes of putting someone else out of business. This happens to every thread in Car Talk at some point. Dont underestimate the bargaining power of VW and Toyota with their suppliers. The cost sharing structure would be very different with VW/Toyota than Telsa. For example, If it costs Tesla $38k to make the $35k version of the Model 3, i would think it should cost significantly less for Toyota and VW to build the same car, thus to sell them at a much lower price. The silver lining is, it is because they cost so much, that is maybe why they have the status they do today. Last edited by oonowindoo; 12-07-2018 at 11:48 AM. Tesla is like an extreme example of when you don't let the beancounters win when it comes to engineering decisions. Yes... they have sped up the electrification of auto industry. But at some point the bean counters will catch up to them. They cannot escape the fate of a big corporation as they continue to grow. Tesla has so much status that, should they ever go bankrupt, one of the major manufacturers would probably try to buy up their brand and technology. Yah they are not going to let the perception to go waste... after all that is probably the most valuable thing they have built, cuz E-cars are depreciating like no other. Both Toyota and VW are investor owned and investors NEVER want to lose money. Undercutting a bit? Sure. As long as profits from everywhere else can mask it (transparently) and doesn’t hurt investors. But taking a decent sized financial hit? Ain’t ever gonna happen. I don’t doubt they can build a similar car for cheaper than Tesla. Tesla is still a baby in the manufacturing game. I’m sure VW and Toyota have efficiencies developed over decades. But build for way cheaper? I highly doubt it. Last edited by TacoBello; 12-07-2018 at 07:19 PM. #1 , we dont know if VW or Toyota will lose $$ from selling their "cheaper" version. All i said is they can afford to do so to enter a market to compete with Tesla. That is common practice in the business word, You can't just jump in and charge as much as the market leader for the same product. You Must offer some kind of incentive to start. #2. Didn't Tesla say they lose $ from selling their $35k model 3 that costs them $38k to build? How are Tesla's investors any different from Toyota and VW? #3 I really dont think there is any direct correlation between how much they charge on a specific model and how that will have real affects on the investor. Maybe on Tesla... not to Toyota and VW. There are many factors that investors will gain or lose $. Just because you are charging at cost or lower than cost on 1 or 2 models does not mean the investors will loose $$. That is like saying you invested in Apple and they lowered their iPhone 11's MSRP by $200.... next year and all of a sudden you will lose $? If anything, i see the total opposite, it does not matter how much VW/Toyota charges for their model 3 competitors. I think their stock price will rise due to the investment to compete with Tesla head to head = investors will earn $. Not sure if they will, but even if they lose in the beginning, it will have little to no effect on their business as a whole because the cost will be easily distributed. That is one of the biggest advantages for being #1 or #2. I am not sure what happens to Tesla's investors' confidence when that happens. Last edited by oonowindoo; 12-10-2018 at 11:51 AM. Samsung makes a cheaper/better phone than Apple. Biker, who believes Tesla has reached cult status like Apple and will sell their wares regardless of competition. Samsung doesn't make a cheaper/better phone than Apple in the same way that Honda doesn't make a cheaper/better car than a BMW. They are different products catering to a different market. In full disclosure I use a Pixel 2 and love it, will never use Apple. Also isn't $200CAD like $5? Auto manufacturing is all about economies of scale. This is how they get costs down with buying parts in bulk and creating manufacturing efficiencies. In 2017, VAG manufactured somewhere in the neighborhood of 10 MILLION cars. Tesla can hardly put out 100k a year. Each of these cars isn't 100% unique either so the economies of scale for various components can be leveraged across the entire portfolio, not to mention lower NRE costs for not reinventing/redesigning things, help enormously. I bet a VW eGolf would cost just as much as a Tesla 3 if they didn't leverage almost the entirety of the Golf product to make it. Speaking of the eGolf, they were able to produce a car that has a 125mi range for a cost of ~$30k (before tax breaks) in a totally half assed attempt without even trying. If they toss in even a moderate effort at this, they will absolutely clobber Tesla in every measurable way. Tesla is definitely investor owned in the same way every major manufacturer is. No one likes to lose money and Tesla mitigates the loss on the car by offering options that should be standard in a car of that price that have a much higher margin. Because of that, the $35k Tesla would never exist much in the same way you'll never find an absolute base model Porsche or MB anywhere. I definitely believe VW can drastically undercut Tesla on this one. They can basically take an already fully developed car that they'd be doing anyway and toss an electric drivetrain in it. On the flip side, Tesla has to also develop (and pay for developing) an entire car. Additionally, VW can utilize said drivetrain on a multitude of products all at once with one design effort. Electric A4? Sure, the eJetta comes with that for free. The previously mentioned eGolf was basically free. Same goes with all the other MQB cars, lol. The economies of scale are going to really drive prices down. It's only a matter of time. The economies of scale are going to really drive prices down. It's only a matter of time. True, but on a pure EV car, the batteries are the biggest cost item and Tesla has been doing that for years now and way ahead of everyone else. VW may be able to make the rest of the car cheaper, but very unlikely on the battery, in the short term. Anyone notice how few Gen 1 Priuses are still on the road? EVs inherently make us buy new cars because most people won’t pay $10K for new batteries for a $2K car. I am all for EVs, but as long as batteries are tough to change and really expensive I think they are actually more harmful than helpful. Audi has been doing the eTron for a while now. Jaguar has started the iPace line. BMW has the i3/i8, the 330e, 530e, and 730e. Ford has the Energi models, GM has the Bolt. All of these have been sidebar projects for these brands in addition to their "day job" and, as such, they haven't really put forth any actual effort in EV development. The minute they do, and it seems like now is that time, it'll be game over. Either that or Tesla will get bought out. The Porsche Taycan EV doesn't begin production until the middle of next year, with deliveries at least a year away. Nevertheless, Porsche has done so well with Taycan preorders that earlier this month company CEO Oliver Blume said it would increase production. At the L.A. Auto Show, Porsche USA CEO Klaus Zellmer told CNET, "If all the people [who preordered] buy this car, then we are sold out for the first year." We aren't sure if Zellmer referred to the U.S. market specifically, but many thousands of hand-raisers have popped up all over the world. We've read the company initially planned on producing 20,000 units per year, but the increased figure could go as high as 30,000, split between the sedan and the Taycan Sport Turismo. Confident in the product and the potential, Porsche planned for the bump by giving the Zuffenhausen facility, which will build the EV, a dedicated assembly line and paint shop. In EV-hungry Norway, Porsche typically sells 600 new cars per year. When the Taycan preorder site opened there, nearly 3,000 potential buyers paid refundable deposits of roughly $2,250 to put their names on the build list. There's been a similar response in the United States based on Internet stories and comments about what's happening at the roughly 200 Porsche dealers. It appears dealers don't know their allotments yet, but Inside EVs said it will be "as many as 50" per store. If all dealers got 50 Taycans, that would make for around 10,000 U.S.-bound units, an entirely reasonable number with respect to Zellmer's comments. Seems the deposit process isn't as straightforward in the U.S. as it is in Norway, France and Belgium, though. One U.S. hand-raiser wrote that the Porsche dealership in Bellevue, Washington, didn't ask for any money when he submitted his information, instead telling him that the dealer "will hold off on taking the $2,500 deposit Porsche will require until another date. We want you to keep your money working for you." Someone else, commenting on a different site, said he put down a $5,000 deposit and was 33rd in line at his unnamed dealer. A third registrant, mentioning that same Bellevue dealer, implied he hadn't paid anything either, but that buyers had attempted to make deposits as a way to jump the line. Who are these people? According to Zellmer, over half the signups come from people who have never owned or don't now own a Porsche. The key bit of intel, however, was when Zellmer indicated where conquest buyers have come from. "Typically, if we look at our source of business," he said, "people coming from other brands, it's Audi, BMW, or Mercedes. The No. 1 brand now is Tesla." A Norwegian intender said he felt his Tesla Model S leaned too much toward being a family car, and he signed up for the Taycan to get into something more focused on performance. Considering what the Model S can do, that's a fascinating rationale. But we'll likely discover a bunch more fascinating things about the Taycan and its effect on the market by the time it arrives. And this is likely to be one of the more expensive and exclusive of the various new electric cars hitting the market in the next few years. Lower cost ones will sell even more. VW and Toyota will get the battery cheaper than Tesla, that is a given. What we dont know is by how much. But given by the volume, i would assume significantly. otherwise, our whole Business 101 course was a waste. If VW and Toyota really want to do it, which it seems they will. Worst comes to worst, they will just build or go buy their own battery plant. They are big enough just to do that. Instant torque is great, however. And not having to fill up. And blowing the doors off of supercars 2-3x the price of your car, with your daily. With the exception like myself who have motion sickness, most of the people will get an EV as their primary or 2nd car eventually in the near future if the prices/range/recharging issue can get resolved. The only way that gets resolved is if the big ones join the party. I'd be down for an electric commuter motorcycle, if the decent ones weren't $16k, and if I could plug in at the office, even just with a standard wall plug. And so it begins...RIP Tesla. Is that the $30k Model 3 Tesla was talking about years ago? You mean the one we still haven't seen? Then yes, that one. Also, it was $35k. Tesla fanboys are comparing VW to Blackberry. Always good for a laugh. How is that even relevant? 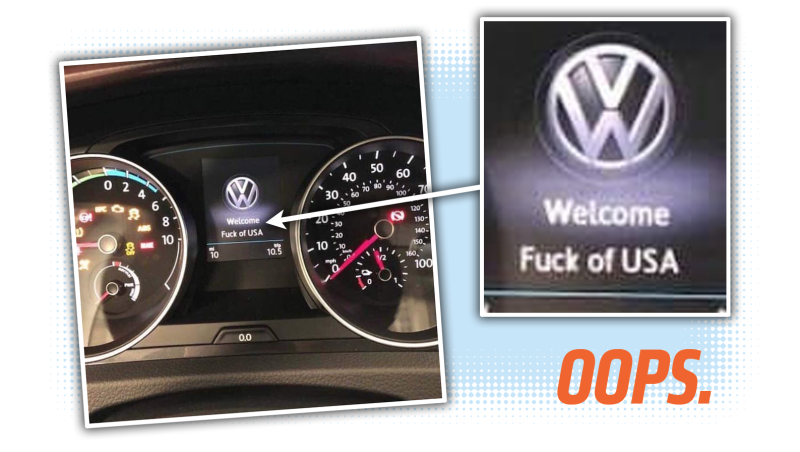 VW is #1 and Blackberry is as good as dead. Someone in shipping with too much time on their hands? I'm annoyed they couldn't fit the extra "F" in there to be grammatically correct...I would have dumped the A for it if they ran out of space. If they weren’t a native speaker that could be why. Seems a common error. WOLFSBURG, Germany -- If Volkswagen Group realizes its ambition of becoming the global leader in electric cars, it will be thanks to a radical and risky bet born out of the biggest calamity in its history. The German giant has staked its future, to the tune of 80 billion euros ($91 billion), on being able to profitably mass-produce electric vehicles -- a feat no carmaker has come close to achieving. So far mainstream automakers' electric plans have had one main goal: to protect profits gleaned from high-margin conventional cars by adding enough zero-emission vehicles to their fleet to meet clean-air rules. At the meeting hosted by then VW brand chief Herbert Diess, nine top managers gathered on a cloudy Saturday afternoon to discuss the way forward after regulators blew the whistle on the company's emissions cheating, a scandal that cost it more than 27 billion euros in fines and tainted its name. Now the "villain" of the VW scandal is likely to become the largest producer of electric cars in the world in coming years, analysts say, putting it in pole position to flood the market -- should the demand materialize. "Decisions to convert the Emden factory (in Lower Saxony) to build electric cars, would never have happened without this Saturday meeting," said Stackmann, one of five senior VW executives who spoke to Reuters. Strategic perilsIt's a risky bet. But he added that EU and Chinese emissions regulations made electric vehicle adoption inevitable and that being an early industry mover in that direction offered a "positive risk-reward." Another by-product of the diesel scandal that quickened VW's electric drive, according to the senior executives, was a purge of the company's old guard, who became the focus of public and political anger. Diess, who joined from BMW where he helped pioneer a ground-breaking electric vehicle, has since been appointed CEO of the parent Volkswagen Group, a multi-brand empire that includes Audi, Porsche, Bentley, Seat, Skoda, Lamborghini and Ducati. A 300-mile-range battery costs around $20,000, compared with a gasoline engine that costs around $5,000. Add to that another $2,000 for the electric motor and inverter, and the gap is even wider. Even EV maker Tesla's cheapest car, the Model 3, is on sale in Germany at 55,400 euros, priced just below a base model Porsche Macan, a compact SUV. In the United States, Model 3 prices start at $42,900, following a price cut announced Wednesday. The carmaker's electric-vehicle budget outstrips that of its closest competitor, Germany's Daimler AG, which has committed $42 billion. General Motors has said it plans to spend a combined $8 billion on electric and self-driving vehicles. The Renault-Nissan-Mitsubishi Alliance said in late 2017 it would spend 10 billion euros by 2022 on developing electric and autonomous cars. "On a 2025 view, we expect Volkswagen to be the No. 1 electric vehicles producer globally," UBS analyst Patrick Hummel said. "Tesla is likely to remain a niche player." Stricter testingVW's test cheating using engine management software - "defeat devices" - resulted in the introduction of tougher pollution tests which revealed in 2016 and 2017 that emissions readings across the industry were up to 20 percent higher under real-world driving conditions compared with lab conditions. Carmakers have struggled to lower their average fleet emissions because of a shift in customer taste toward heavier, bigger trucks and SUVs, which make it harder to maintain the same levels of acceleration and comfort without increasing fuel consumption and pollution. As the industry-wide scale of excessive emissions prompted European regulator to push through tougher laws late last year, VW executives concluded that purely electric cars were the most efficient way to meet carbon dioxide goals across its fleet. This was the point of no return, according to executives, when the company made the final electric investment decisions and committed to staying the course it had plotted after the diesel scandal. In the United States, VW's move to EVs will have a dramatic impact. Last month, VW said it is adding a second Chattanooga assembly plant in Tennessee to build electric vehicles for Volkswagen and potentially other brands, with an $800 million investment expected to create 1,000 jobs at the German automaker's only U.S. assembly operation. VW announced at the Detroit auto show that the new factory -- which will be built next to the existing plant producing internal combustion vehicles -- will begin producing EVs for North America in 2022. The EVs will be built on VW's modular electric toolkit chassis, known as MEB. When production begins, the Chattanooga site will be one of six VW Group assembly plants globally dedicated to producing battery-electric vehicles, and the only one in North America. The 3.4 million-square-foot Chattanooga plant employs about 3,500 workers. VW has committed to an aggressive battery-electric plan for North America, beginning with the I.D. Crozz crossover set to arrive in the United States in 2020, and including what the automaker calls a "multipurpose" electric vehicle based on the I.D. Buzz concept. The I.D. Buzz was a retro styled version of VW's former Microbus, and is expected to return to the U.S. in 2022. German auto giant Volkswagen is again teasing the U.S. market with hints that it could build a pickup destined for American dealerships. Recently, Volkswagen entered into an agreement with Ford which would enable the duo to share the costs and technologies associated with product development across the two brands. Ford would provide VW with knowledge from its Ranger and Transit lines in exchange for the Germans sharing the deep-rooted secrets of its long-successful Transporter vans. One particular portion of the agreement, which proves to be particularly interesting for the Volkswagen brand's loyal followers, is the possibility of a new pickup under the German marque. You see, Ford has agreed to develop VW-branded trucks on the Ranger platform, but only for non-U.S. markets. A Ford spokesperson told The Drive in January that the agreement covered trucks destined for Europe, Africa, and South America only. But nothing is set in stone. Volkswagen Global CEO Herbert Diess previously spoke about the decision making power of Scott Keogh, Volkswagen of America's newest CEO. It will be on Keogh's shoulders to determine if the product placement is right for the U.S. market—and it just might be. "We think we are now, finally, with our SUVs, a mainstream manufacturer, but without a doubt, the biggest open space is pickup,” Keogh told CNET in an interview. "I think this is an opportunity for Volkswagen, if you look at how we position the brand we are capable of entering the pickup market with a car we're proud of." Volkswagen prides itself into bringing something special to the table. Unlike the rebadged Routan minivan it released in 2009 (which shared a platform with the Dodge Grand Caravan), Volkswagen isn't ready to just slap a badge on a Ranger and call it a day. Instead, if the automaker chooses to pursue competing in the crowded U.S. pickup market, the brand recognizes that it must offer something unique. For now, all future actions remain up in the air, but the niche market that Volkswagen can corner after being absent from trucks for so long might be larger than we think.